Picture perfect landscapes, white-sandy beaches, lush rain forests, and soaring mountains. Belize has it all. My recent vacation to Belize was beautiful and exciting. But also one I’d rather not promote too much. Belize is in so many ways undiscovered and that is its charm. But not to be selfish, let me tell you where to go in Belize and the great things you can do. Most tourists end up at one of the sunny islands, known as the cayes. After we toured around the country we ended up there too. So we understand why you want to go. But don’t skip the mainland. My advice: rent a car. Belize has great highways and it is easy to explore all the Districts. It isn’t that big but there is a lot to explore. Combine it with a few beach days at the end to unwind. What made my trip unforgettable and so incredible? Many of the earliest-known Maya settlements were built in Belize. I was excited to see these ancient cities. After thousands of years, the old towering temples are a part of the dense jungle again; overgrown with trees and dirt. Sometimes we didn’t even notice when we passed a Maya site. You just think it’s a mountain or a hill. It was amazing to see the other side uncovered revealing a temple. I started thinking every mountain could possibly be a Maya site. At the sites, archaeologists were still working to excavate the structures piece by piece. I was amazing that they could possibly make a new discovery at any minute. I mostly felt ‘part of the discovery’ on our first day. We were dropped in the middle of a jungle with our licensed tour guide. He explained we had to hike for 45 minutes and cross a river stream 3 times before we would end up at the entrance of this amazing cave. It’s a shame we couldn’t film in the Actun Tunichil Muknal (ATM) Cave. This place was just ridiculously fun, adventurous, mystical and dangerous at the same time. Geared with a helm with headlight we entered the cold water and swam into the cave and continued crawling through narrow passages and climbing up on the rocks. A real Indiana Jones adventure. The Maya reached out to their gods in this cave and performed human sacrifices and bloodlettings. The most exciting part is to see the real skeletons, ceramics, and stoneware they have left behind. Unreal. ATM Tour – Cayo District: No-brainer, if you are fit you should do it. Xunantunich – Cayo District: Easy accessible with 6 plazas, well-maintained and growing every day. Lamanai – Northern District: Don’t book a cheap tour of $50,-. They will take a lot of people which isn’t the best experience. We made that mistake. The boat ride is pretty spectacular, though. Ask you tour guide to show you the last updated Maya calendar. It’s the original one that for a lot of people signified the end of the world back in 2012. Cerro Maya – Northern District: Beautiful small beachfront site, but in the rainy season crazy infested with mosquitos. Fun drive to get there crossing the river with a hand-cranked bridge on the road to Corazol. 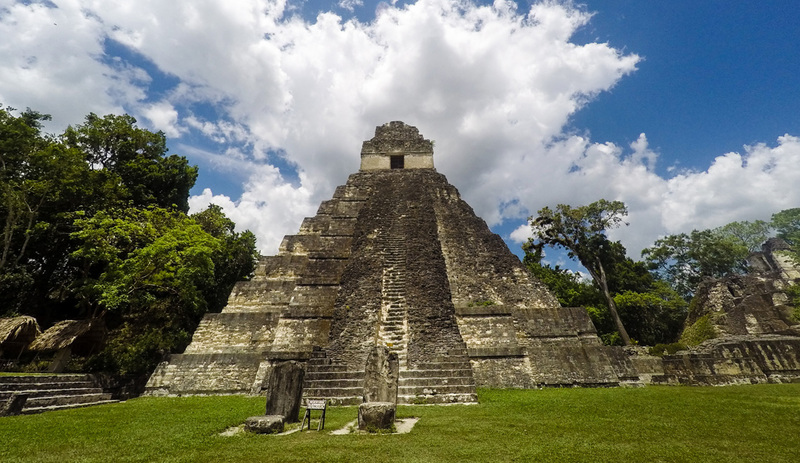 Tikal – Guatemala: The most impressive Maya site we have been. Book a private tour if you can. It’s worth every penny to discover this place at your own pace. Belize is mostly covered by dense jungle. A great habitat for many animals. Of all the countries in the Caribbean, this place was the best to get close to the animals in the wild. I would have loved to see a jaguar. They are found everywhere in Belize, but no luck. Instead, we saw lots of other animals in their natural surroundings; from monkeys to manatees, to sharks, to big spiders. And you’re likely to see lots of fascinating birds at any time. We are no birders but you can spot them quite easily, even driving across the country. Birdwatching – Cayo District: The Birdwatching tour at the Chaa Creek Lodge was great. They have spotted more than 300 species in their garden alone! Manatees – Belize District: Bumpy drive to the small village of Gales Point Manatee. Just ask the locals and find someone willing to take you out on the lake. In the rainy season, the water won’t be clear so it will be harder to spot them. Wildlife: I have seen Howler and Spider monkeys in the eco-resorts and at different Maya sites. 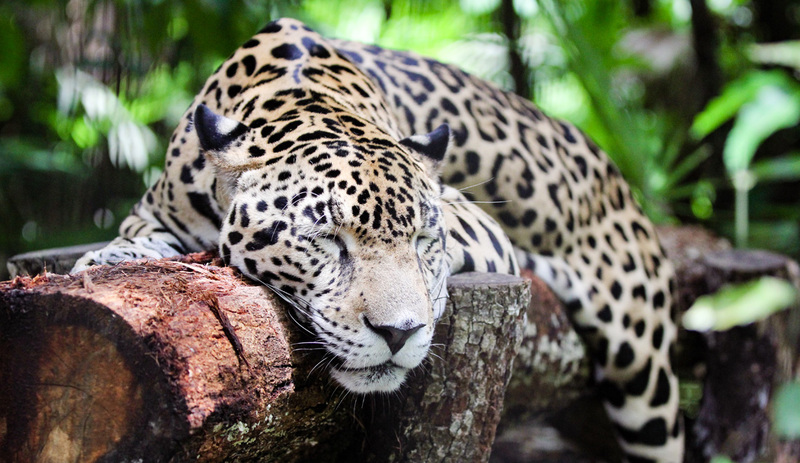 For the Jaguar or the national animal of Belize the Tapir’s and other animals, I would recommend the Belize Zoo where they take care of rescued animals. When the animals are ready. they are introduced back into the wild. So it’s not your typical Zoo. but more a conservation and a place for locals to learn about their environment. Marine Life – Ambergris Caye: Go to Hol Chan Cut Marine reserve and Shark Ray Alley. You need a boat to get there. For me the best snorkeling ever (the video shows nurse sharks, turtles, and schools of fish). Almost half of the territory is under official protection. The forests en reefs are natural treasures and need to be preserved. There has been a lot of deforestation in Belize in centuries past. It is good to see that the jungle is building itself up again and the Belizeans allow that to happen. This also means that every time, you get back there, it looks even more beautiful. Driving the Hummingbird Highway for me was the most beautiful road I have ever driven. It winds through mountains, orchards, jungles and here and there a tiny village. We even swam in a sink hole right off the highway. Best part, we had the place to ourselves (like many times in Belize). Unfortunately, there is a lot of poverty in Belize. Fortunately, the Belizean people are proud of what they have and you hardly see any trash. It is on go the cleanest countries we have visited in the Caribbean. St. Herman’s Blue Hole National Park – Cayo District: Swim in the sapphire blue sinkhole in the middle of the jungle. Hummingbird Highway – Cayo District: Enjoy the views along the way. 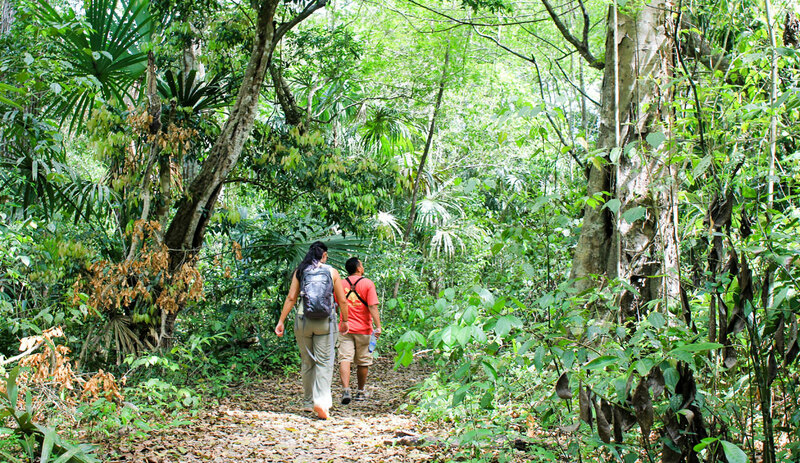 Bocawina National Park – Southern District: Explore trails in dense forest, leading to the Bocawina Falls. We got the ultimate tropical island feel at the Cayes. You really get thrown back in time and we got to lime (relax) at the beaches on the laid-back coastal villages in the South, like Hopkins. Visiting Hopkins is a unique experience. Leaving the Misty Maya Mountains behind you have to cross a big swamp. Looking at the different birds, it gave me a feeling we were reaching the middle of nowhere. When you enter the rustic village you are immediately just a stone throw away from the ocean many side roads turn into the beach. We also visited the much more touristic village of Placencia. When we say touristy, don’t think of South Beach of the Aruba high rise hotels. It is still laid back. The center of the village is located at the southern tip of a long sandy peninsula. Placencia has some of the best restaurants, beautiful resorts and lots of souvenir shops. I liked Hopkins better because of it’s laid back and rustic ambiance. I always had thought Madonna liked a guy named San Pedro… until I visited San Pedro myself and also fell in love. With the island that is! She was referring to the capital of Ambergris Caye. A beautiful (but crowded) ferry ride will bring you to this tropical island paradise in 1.5 hours. This is the perfect place to relax and unwind. I read that it was a touristic town, but not compared to many other popular Caribbean islands (just like they said about Placencia). The main method transportation on the island is by golf cart (make sure you rent one to feel like a true Belizean island dweller). I loved this island so much I could make it my home. The only downfall was, no surfing (big bummer for my hubby) and imported drinks (spirits and wines) are way too expensive. Hopkins – Southern District: The rainy season can turn the normally blue waters brown. So take note when you like to go. Placencia – Southern District: Visit Lobster Fest, it is one of the bigger festivals in Belize. Watch the Whale Sharks pass by Placencia in May until June. Ambergris Caye – Northern Cayes: Relax, unwind and plan some activities to visit Shark Ray Alley, go snorkeling, kayaking, diving or just sip up a fruity cocktail. Saved Money; we booked our trip in June in the green season. I wouldn’t mind a little rain because I live on a tropical island. The reason I like the off season is it is less touristy and hotel prices are lower. Tours are often not fully booked so you get a private guided tour almost every time. Convinced? Or have you been? Please share your stories with me!